AceReader is designed to assess, improve and monitor reading speed, fluency and comprehension. Education Edition, Family Edition, Personal Edition and the Classic Desktop version. The Education Edition of AceReader is our flagship product, developed exclusively for schools. The AceReader Education Edition has been designed around the needs of schools, teachers and students to deliver a classroom level application that integrates well with existing reading classes, or can be used as a teaching supplement. The Family Edition of AceReader is a streamlined version of the Education Edition, which includes a parent account for managing two to eight student accounts, enough for the whole family. The AceReader Family Edition is also ideal for homeschooling use. The Personal Edition of AceReader contains everything in the Education Edition except for the administrative features required by schools and teachers. This enables individuals to use the same great application found in schools, but on a personal level. Looking for the original desktop version of AceReader? We still offer AceReader Elite and the AceReader Elite Premium Package, which includes the Iris Reading videos for those customers looking for a single, stand-alone desktop installation. Runs in web browser (i.e. Chrome, Safari, Edge, Internet Explorer, Firefox…) on desktops, laptops (PC's and Mac's) or mobile devices (i.e. iPads, Android tablets…). Students and Teachers can run program from anywhere at any time from school or home. Course Mode - Offers a very simple to use automated self-adjusting course. Menu Mode - Gives you more control and lets you pick and choose training activities. Read Mode - This is a powerful eReader and allows you to have full control by letting you load your own material (i.e. documents, eBooks, text from web pages, emails...), set the display modes and speed settings. This mode lets you train (or read) with material you needed to read anyway. Includes Flash Card Bonus Game. For younger students: State Capitals and Multiplication Tables. For older students and adults: Leveled Vocabulary exercises. Goal Setting - Track progress relative to your goal and set pacing speeds at speeds relative to your current and goal speeds. Progress thermometers indicating status of daily and course activities. Teacher accounts - Teacher accounts are like Admin accounts, but they can't set school wide options and can only see and manage their own classes and students. Dashboard – From the Dashboard, teachers can post messages to students, view basic usage metrics and post questions to the AceReader support team. Reports - Progress Monitoring: Pre- and Post-Assessment Reports for individual students, classes and school. This report allows teachers to see overall progress between when students started using the program and the last time they took an assessment test. User Management - Ability to add and remove Admin, Teacher and Student accounts. Edit students' names, usernames and passwords; specify user type, reset students' history and set specific options (including training level). Ability to import user spreadsheet to create Teacher and Student accounts. Class Management - Ability to add, remove and close classes. Classes are typically associated with teachers and groups of students that have specified options and training levels. Ability to specify class-wide options and student training levels. Each school is provided with its own unique domain and database for storing content and student results. With this architecture, the AceReader support team can help you customize courses and content to fit your education curriculum. Free phone and web conferences to train Administrators and Teachers. We provide initial setup and ongoing training as part of our commitment to educators. 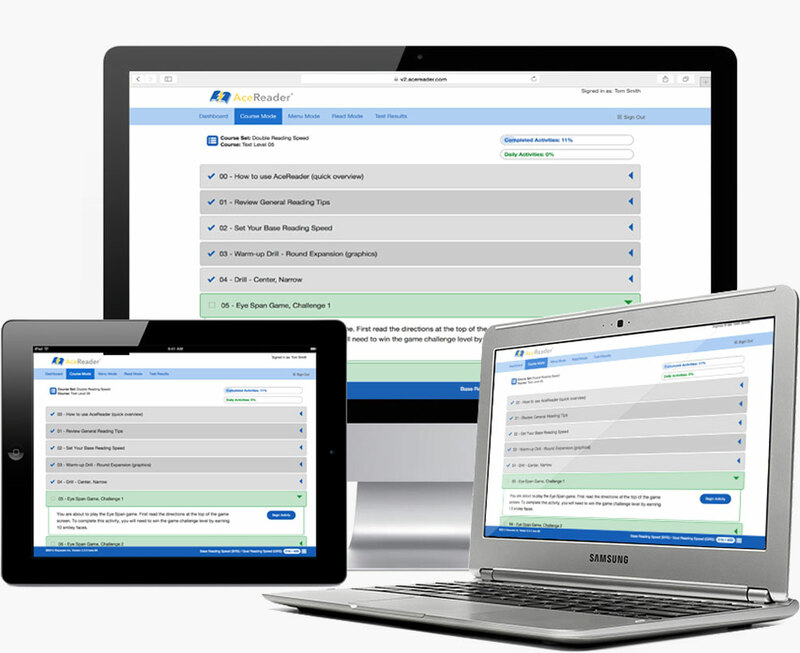 Users can submit questions and requests to AceReader support team through the AceReader interface. Customer support is our #1 priority. All customers can reach us by email or toll free phone.